Gold community digital currency GGT (Global Gold Token) issued by Goldlinks, the global gold industry blockchain alliance, was officially listed for trading on BitForex, the world's leading digital currency exchange, on 17 October. October 17, 2018 /PressReleaseAgency/ — Global gold industry blockchain alliance Goldlinks offered its community members a utility token, Global Gold Token (GGT), trading on Bitforex exchange in Seoul, South Korea on 17 October. The token sale aimed to fund the management of its eco-community, whose members have invested earlier in Goldlinks’ gold-backed digital currency, known as Global Gold Cash (GGC). 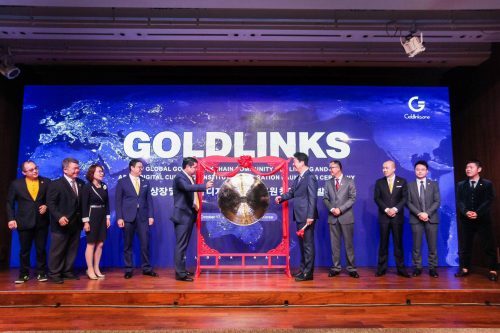 Goldlinks held a listing ceremony and a news conference in Seoul in the morning. Attendees at the media event for its gold-backed digital currency came from different parts of the world, including the political and business leaders in South Korea and the financial and blockchain experts from the other parts of Asia. During the meeting, Goldlinks, with a number of prominent Korean enterprises, Asian business groups and financial institutions, jointly announced a plan to launch the Asian Digital Currency Institution in a bid to promote the research and application of digital currency technology in various commercial and public sectors. Goldlinks is a digital-asset distribution and trading platform built on the blockchain technology for the global gold industry. Its new token GGT served as a certificate of identification for the Goldlinks community members as well as for performing such functions as to record, manage and distribute the value of its eco-community members, which was reflected by the value of GGC they own. GGT's initial offering amount was 20 billion tokens, and each year afterwards the Goldlinks Foundation would take out 20 percent of its profits to buy back the tokens until it finally decreased to two billion GGTs. Such a deflationary mechanism ensures that the number of GGTs in circulation will go down, while its token value will rise, because Goldlinks’ membership value will increase as its gold-backed coin GGC gains wider application in commerce as a means of transaction, making itself an extremely attractive option for investment currency. Speaking of its recently offered gold-backed Global Gold Cash, a breakthrough in the history of monetary system, Ouyang Yun, CEO of the Goldlinks Foundation Ltd told the press conference in Seoul that just like physical gold, GGC was a transparent, secure and reliable safe-haven asset, because it was issued with 100 percent physical gold reserves as its underlying asset. At present, a hundred GGC coins equal to a gram of physical gold. “It has a complete and decentralized underlying asset management system. Its underlying assets are overseen by a third-party independent gold custody company, periodically audited by third-party eligible audit institutions, and it strictly complies with KYC (KnowYourCustomer) to ensure the security and transparency of the assets represented by GGC,” said Ouyang. The natural monetary properties of gold have been the largest value consensus of mankind for 6,000 years. Now, with the rise of digital currency technology, GGC is expected to bring gold’s value back to practical international trade payment, given that it has inherited the scarcity of gold and the value of hedging against general ledger and exchange rate fluctuations. A South Korean company accepted GGC as the currency of settlement for its international trade business in September, and successfully withdrew from Hong Kong-based Brink's vault a standard gold bar, Reuters reported earlier. The incident marked for the first time an application of gold-backed digital currency in the complete procedure of international trade settlement from issuance to circulation and payment, a more efficient trade model created thanks to GGC.